The 1999 vintage is well-regarded by Piemontese producers, as there are many really good Nebbiolo-based wines in this vintage. June and July brought hot weather to the Langhe with temperatures going down in August. September warmed up again, allowing for the harvesting of good quality fruit. The quality, of course, is dictated by the dedication of the grower in the vineyard. Too much fruit produced lighter, standard quality wines, while smaller yields made for greater intensity. We organized a tasting featuring some famous properties and some new-comers. 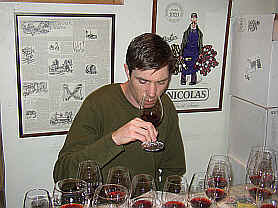 The wines have become quite costly, so being able to taste and compare before purchase is especially important these days. 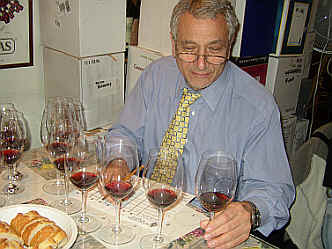 We have never had a distribution in the results as we had in this tasting. This is due to the wines all being of "good" quality at a minimum. 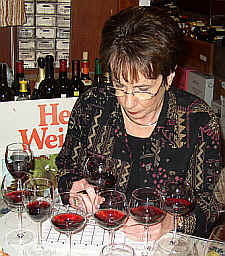 Three wines were ahead of the rest, with "the rest" being virtually tied. We have never had 4 wines score identically, with one other wine a single point ahead of the four! The ties are broken by the greater number of firsts, then greater number of seconds and/or thirds. The wines are young, of course. But not backwards as much as they are simply not developed very much. This tasting was rather like un-baked bread: it's easy to see its shape and form, but you are well distant from being able to enjoy it. These Barolo wines really should be kept in the cellar for many more years before they are released (I know the producers will argue they have neither the cellar space nor the economic resources to hold wines that long). But the fact of the matter is these wines DO cost a small fortune and opening a bottle to put on the dinner table tonight (or in the next year or so) is simply infanticide. 8th Place: CONTERNO-FANTINO 1999 BAROLO "PARUSSI"
One taster objected to the intensity of what was described as "black licorice" in this wine, which they felt had "nice balance, but overwhelming anise notes." Another critic detected a "lot of leather, but I ranked it second because it hurt less on the palate than many of the other wines!" A third critic found a "citrus tang" and wondered if the bottle was "off." Another critic felt this "will be excellent in 2040!" Someone else found notes of "tomato concass, blackberry, plum and nutmeg." One other person said "It's better on the palate than on the nose, but it still lacks a bit of stuffing." I detected a slight note I described as "eucalyptus," as the wine displays a hint of a resiny quality on the nose. The wine is nice on the palate, showing some berry fruit and mild woodsy notes. It's got a nice balance of fruit and tannin. You can stash this for 10-15 years with ease. I gave it a one-and-a-half star rating on my three star scale, no stars being a standard or ordinary wine. 7th Place: BRUNO GIACOSA 1999 BAROLO "FALLETTO DI SERRALUNGA"
Enjoyed by one taster who found "leafy notes and some soil fragrances which is why I liked it." But another critic felt it "lacked the terroir of Barolo and was more like a Langhe Rosso." A third person found "Unmistakable tobacco and ash notes." Someone else said "It's one dimensional, but at least the wine is not suffocated by tannin." Another panel member found "currant and red berries with a mildly minerally quality." Someone else said this wine "changed the least over the course of the tasting." A couple of others found some fruit notes, one detecting "artificial strawberry" and the other "tart cherries." With Giacosa's wine, I found a very lightly cherryish fruit element on the nose with a whiff of tobacco. It was the lightest in color, but the nose was good. 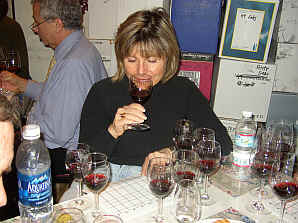 Yet on the palate the wine was simply lighter and a bit less deep than the rest of the field. It is a bit softer and more drinkable now than most of the others, yet at the prices Giacosa's wines command, I can't say I shall be lining up for the chance to buy another bottle. I gave it a one-half star rating. 6th LUIGI EINAUDI 1999 BAROLO "NEI CANNUBI"
One critic felt "This had the best nose to start but it diminished and did not deliver much on the palate, though it has a hint of anise." Someone else found "Sweet strawberry candy and strawberry fruit on the palate." A third critic found some "anise on the nose, though a bit flabby and the most accessible wine of the tasting." Someone else characterized this as "Classically styled, with notes of dried roses and tar." Another taster found notes of "violets." One detractor said it "...is soft and light on the palate but there's a disturbing off note that strikes me as slightly medicinal." A final note was that the wine shows "Spicy, violety notes with some stewed rhubarb-like elements." I found hints of berries and cherries with a lightly meaty note. It's certainly rather tannic, needing a decade to come around, but seems to have enough cherry-like fruit on the palate to warrant cellaring. One-and-a-half stars. 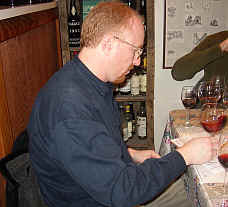 5th Place: ALDO CONTERNO 1999 BAROLO "CICALA"
Described by one person as having "softer tannins and lots of peppery notes along with a nice finish," Conterno's wine had its fans and its detractors. One critic felt it grew "more sour as it sat in the glass," while another person found it to be "tart and displaying unripe fruit. 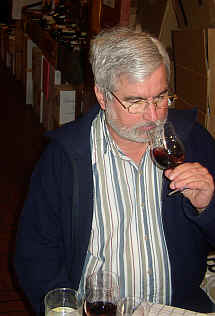 The nose is quite different as well, showing notes of leather and chocolate." Someone else was impressed that this "...is the only wine which can be aged until 2040. It's super rich and has a really complex nose." Another taster felt this has "too much oak," while another taster said it's "overripe, soft and lacks a bit of fruit." Bob mentioned a butter and caramel aspect to the wood here and that the "cassis-like fruit is not typical." I found it to be very bright and berryish with a high-toned feature that I found interesting. I don't know if this is a sign of volatility, but it is snappy and berryish with a lot of tannin on the palate. One-and-a-half stars. 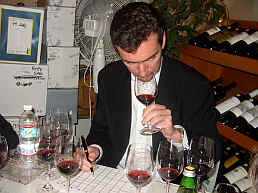 4th Place: PODERI COLLA 1999 BAROLO "DARDI LE ROSE"
Knocked by one critic for being "Rustic and metallic with an off-putting aroma," someone else detected notes of "iodine and tar along with being very tannic and flawed on the palate." Another critic panned it for being "watery in the middle." Someone else found it to have a "leafy aroma," while a final taster said it's reminiscent of "anise and it got better in the glass." I sensed a berry and cherry fruit quality here with mild forest floor notes. It veered off track a bit showing a barn-yard aspect, but it really needs time in the bottle to develop. There seems to be ample fruit to pair with the tannins here. One star now...maybe more later. 3rd Place: MONTI 1999 BAROLO "BUSSIA"
This is a rather new, small producer whose wines have been attracting a bit of attention. One taster described this as "a big mouthful of fruit. Very nice and complex though it's a bit short." Echoing, to some degree, these sentiments was another critic who found it to be "Big, sweet and displaying ripe fruit and a little bit of tar. It's very complex with dark berry notes. Tannic but balanced." A third panel member felt it has a "complex nose and the best proportions in terms of tannin and acidity." Only one detractor spoke up saying it had "tarry notes with a fertilizer or potting soil sort of character." I really liked the nose, which shows some forest floor fragrances and a touch of leather (but not in the sense of Brettanomyces). There's an "old school" quality to this wine. It's tannic and snappy with bright berryish fruit. Two stars! 2nd Place: CONTERNO FANTINO 1999 BAROLO "SOR GINESTRA"
Described by one person as exhibiting "Cherry candy notes with some menthol and eucalyptus...it's like a a twirling ballerina!" Another fan said "It's cherryish and has a wonderful nose being big, rich and complex." A third person felt this showed the "sweetest fruit." One taster noted the "high quality oak which is too overt, perhaps, but it accentuates the character of the fruit." Another person found "black cherry & spice notes with a touch of rhubarb." I enjoyed the oaky, vanillin quality here of this internationally-styled Barolo. But I felt there's enough "Barolo" to go along with all that wood, making for a very attractive wine. It can probably go a decade or two. Two stars+. 1st Place: ROBERTO VOERZIO 1999 BAROLO "CEREQUIO"
"Here's a wine with lush fruit and it seems a bit soft but the tannins are deceptive." said one fan. Someone else said it was "a bit peaty, earthy, has red spice notes and is a classic. It's great now and will be so in the future, too." Another taster said it "has the longest and best finish." 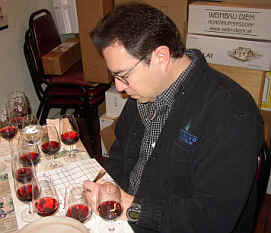 Someone else described the tannins as "fine grained," while a final critic said the "fruit is a tad over-ripe." I detected a really bright cherry fruit aroma and a hint of wood lurking behind it. It's tannic on the palate but not off-the-charts. This is going to need at least ten years to develop and harmonize. It does show promise, however. The price, I should note, has risen dramatically over the past three vintages thanks to various journalists gushing with praise for Voerzio's wines. One-and-a-half stars.